"Which degree lens should I use? What's the difference?" Well, I'm here to help answer a few of your questions as well as dispel some of the myths you might have heard. First off, we sell two different degree lenses here: 10 degree and 5 degree. Both work well with the standard 1" thick walled blades. the longer blades and the 3/4" OD blades where you start to see one outshine the other. More on that below. true, but what most people do NOT realize is that a lens measures the angle that the beam spreads to ON EACH SIDE of center. That means that a 5 degree lens diverts from the center line 5 degrees on each side. That makes for a 10 degree beam, not 5 like many people assume. Same for a 10 degree lens. The beam for it is really 20 degrees. beam than a 5 degree lens does. But which is better for YOU? Well, that depends on which blade you're intending on using the most. If you can visualize that the 10 degree's beam is twice as "fat" as a 5 degree, then it helps you to understand why a short thin walled blade (which has a larger internal diameter) would light up a little better with a 10 degree whereas the 5 degree would be better suited for a longer thin walled blade or a thick walled blade, which has a tighter internal diameter. Likewise, if you are using a thin walled 3/4" OD blade, which are popular to many because of their light weight, then it makes sense that the smaller internal diameter would benefit from the tighter degree beam the 5 degree lens offers. This is only good to a point though. As with any blade, once you get so far away from the light source, the blade will dim out to the point of being too dark. Fortunately, most people don't use 4 or 5 foot blades, so it becomes a question excessive length versus even brightness. MYTH # 1: You don't need a lens. The LED is bright enough as is. I hear they're like a laser. Not true. While Luxeons are VERY bright, they are not a laser and need focusing. Without a lens, the brightness cannot be focused into the blade efficiently. Bottom line: You need a lens. MYTH # 2: All lenses are the same. Again, not true. There are several different degrees of lenses built, but only a couple really work well for the Luxeon blades TCSS sells. MYTH # 3: The tighter the degree, the brighter the blade. As the previous paragraphs have said, certain blades, like a thin walled 1" OD model works better with a 10 degree. Once the blade gets over 30 to 35 inches however, you might want to consider a 5 degree to have the blade light up more evenly. You will lose base flare to some degree by switching to a 5 degree lens however, so if you like that look, you might be better with a 10 degree and limit your blade length to 3 feet or under. "Base flare" is the phenominon where the point of the blade closest to the saber is so bright, it seems to "flare" out and can actually look wider, especially in pictures. 1" thick walled - Generally use a 5 degree lens. A 10 degree will give more base flare if you like that look, but will not light as evenly. 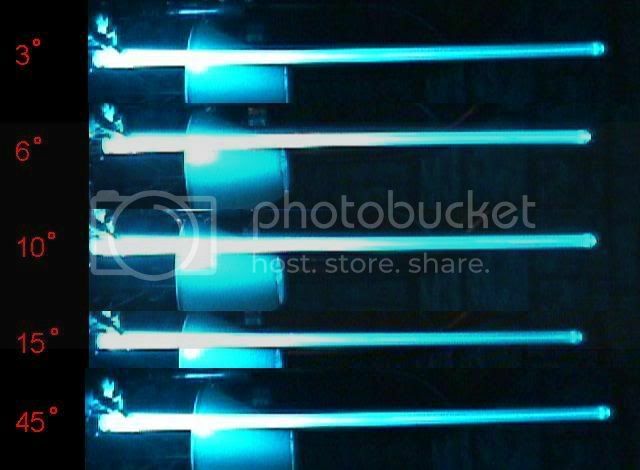 1" thin walled - If under 35 inches long, use a 10 degree lens. If longer, a 5 degree might be better for you. 3/4" thin walled - Pretty much a 5 degree lens all the time. A 10 would be OK for an extremely short blade, but a 5 would be better. nice, wonderful writeup, thanks Corbin! Hay corbin you think this could do more if it was in the new to sabers sections? Actually, I already integrated it into the LED section there with an included link to this thread if people want more info. thankx corbin.... now i dont have to spend time weeding through all the posts to find the answer to that q's i was about to ask! 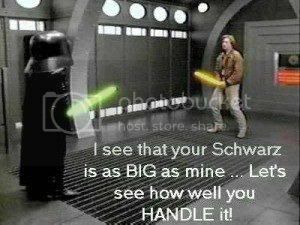 "Hard to see the future is, the Dark Side clouds everthing"
"My Schwartz is Bigger than your Schwartz"!! No problem Orko. Glad to help. That's what we all contribute to the forum for. Like many others before you, I suspect after you've been around here a while and made a few sabers, someone new to the scene will look to something YOU might have posted for information. I was curious if anyone has seen what ultra uses, its basically just a chrome housing like from a maglite. Does anyone know if its any better than an optic or just a different way of doing it? I used one of their luke conversion kits [sorry tim] for Ryu-Kenjushi's rotj saber and noticed there was no actual optic. It seems to look just as good. Proud owner of the first two Darth Maul conversion kits! Thanks Tim! Personally, I don't see a ton of difference between them. I tend to go with 5 degree optics myself though. It keeps dust off the element better, though you could use a clear disk over the reflector to do the same I suppose. For the size, I like the 20mm reflector the best. While the 27mm is ok, it's larger than the blade and makes instalation a pain. The 17mm works OK, but overall, I like the optics. I still have some of the reflectors if you're wanting to try one. Just email me. No thats ok I just basically wanted to be reassured that they are pretty much the same. Like I said I already have one from the luke ultrasabers conversion kit. Thanks for the pic.